A romantic refuge with large pool immersed in extensive secluded grounds. Hidden away in its mature Mediterranean gardens and boasting a large private pool, Rosina is a fabulous spot for a romantic break or honeymoon, with the added bonus of being just a short drive from gorgeous Cefalù with its golden sandy beach, its seafront restaurants and its maze of medieval streets. Inside: accommodation at Rosina is spread over two floors. The main entrance leads via a few steps into a furnished, vaulted hallway, which, after the exterior stone walls, gives one an insight into the property's venerable age and character. To the right, a doorway leads into the cosy wood-beamed living room, which opens onto a pretty shaded patio. Just off the living room is a guest bathroom. To the left of the gallery, another door leads into the convivial, welcoming kitchen-diner. Back in the living room, stairs lead up to the first floor and directly into the romantic master double bedroom with balcony. Off this bedroom, via a short corridor, one accesses a bathroom and a shower room and a second, luminous sitting area. From here one may access the two small single rooms. The upstairs sitting area may also be accessed via a few steps from the garden terraces. Outside: Rosina is so called thanks to the splendid variety of roses that populate its secluded, totally private grounds. The vast, luxuriantly mature gardens also feature a vibrantly verdant array of Mediterranean trees, fragrant shrubs and flowers. Immediately outside the house is a wrap-around stone terrace with a fine selection of al fresco dining and lounging areas. A short stroll up a path through the gardens soon brings one to the delightful pool, which features a beach-style shallow end. Could this be where you will spend most of your time? Probably! An excellent romantic and honeymoon villa, or, thanks to the two single bedrooms, a small family. Due to Rosina's location and the property's thick stone walls there is very limited cell phone reception except for near the pool. The thick old walls of Rosina keep it relatively cool in the summer, making air-conditioning superfluous. 4. the archaeological site of Solunto was once home to Phoenicians, Greeks and Romans and is situated high up on a hill overlooking the Tyrrhenian Sea just to the east of Palermo. 5. see Sicily from the sea by letting us organise a private charter along the north coast of Sicily for you. You'll have time for swimming, snorkelling and sunbathing, while everyone else goes about their life on terra firma! Rosina is a real jewel and all the local staff were extremely pleasant and helpful. We had a great time and thoroughly enjoyed our stay. The pool was fantastic and the caretaker was very kind. Our stay at Rosina was thoroughly enjoyable. The size of the pool was if anything understated. One could get a 20 plus metre swim in this pool (which exceeds the dimensions quoted). Villa Rosina had a lovely setting and pool. We thought Rosina was fantastic. The location was tranquil, the setting was beautiful, the pool and barbecue were both great, and the house itself was charming, well-equipped and comfortable. Rosina is stunning and beautifully private. It's hard to imagine a more idyllic setting than that of the swimming pool perched below the mountains with distant views to the sea. The various spots to eat or relax next to the house were picturesque and well maintained. We greatly appreciated the hard-core barbecue - a facility too often scrimped on at rental villas. Impossible to pick out one thing that we particularly enjoyed in what was a superbly relaxing, varied and rewarding holiday. 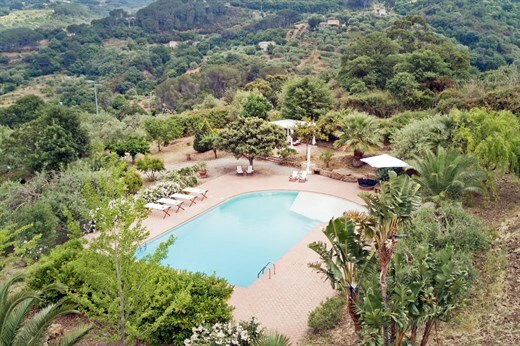 Wonderful pool and communal eating at the villa. We enjoyed the quiet place and lack of modern additions. Lovely old villa. Nicely unfussy. We loved the character, location and luxury of this very well presented villa. The staff did everything within their power to ensure that our stay was everything that we imagined...and more.